When you want the convenience of an online health profile and the instant communication of a custom-engraved medical ID, our SportFit Tech Med ID Bands are the perfect fit. These waterproof, silicone medical IDs feature an adjustable, watch-style closure and your choice of ID tags. Every SportFit Tech ID Tag includes a secure MyID online health profile account, which first responders can access via QR code, website, or 24-hour call center. These access points and your user ID and PIN are engraved on the back of the tag. The front of the tag is custom engravable, giving you the best of both tech IDs and custom medical alert jewelry all in one. This is a great place to engrave immediate, urgent pieces of information, while still using the online health profile for extended histories, med lists, insurance information, and more. 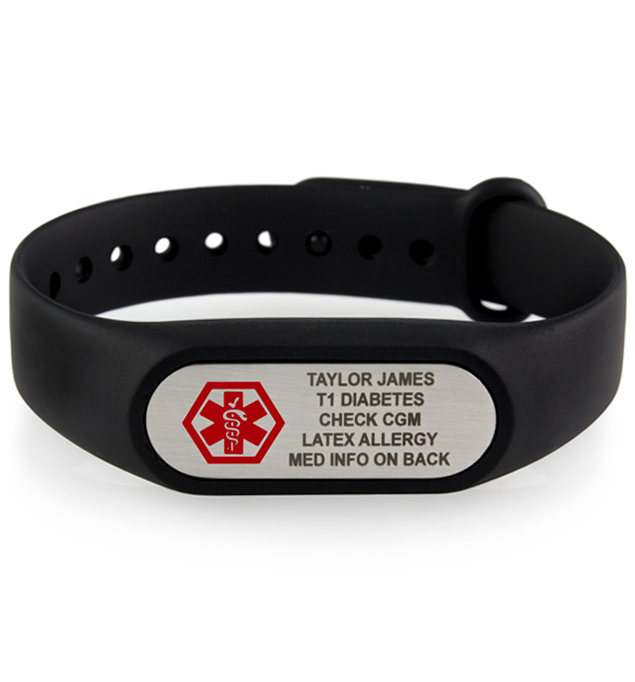 Comfortable and casual, the SportFit Med ID Band and tag are hypoallergenic and waterproof. They look much like a common fitness tracker but bear a medical symbol on the front, alerting first responders to your medical information. Adjustable, waterproof med IDs are particularly convenient for people undergoing weight changes, those with dexterity challenges, and people experiencing intermittent swelling of the extremities. This silicone med ID is a terrific option, whether you wear your medical alert for lymphedema, hyperthyroidism, a stinging insect allergy, steroid use, or any other medical condition or treatment consideration.